The logistic service forms the backbone of the entire e-tailing industry. Hence the biggest of the players have created their own arm to provide the best customer experience and save upon the cost as well. 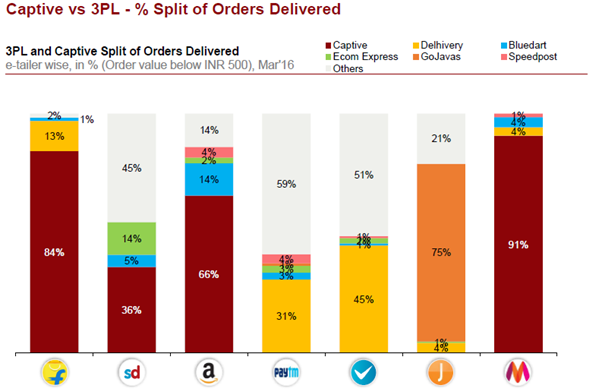 Despite companies like Flipkart, Amazon and Snapdeal having their own logistic arm a good chunk of their orders are delivered by third party logistic companies (3PLs). The snapshot above shows for a month how a typical split of orders looks like between 3PLs and the Captive arms. The companies with best delivery performance (Order to Ship time) are those who deliver most % of their orders via their captive arms. For example, Myntra, which delivered 91% of its orders via its captive arm was able to deliver within an average of 3.4 days in the month of March’16. While this was 7.7 days in the case of Shopclues. The O2D performance and compliance on the promised date of Snapdeal has improved a lot post its investment into Gojavas. The O2D improving by 30% in the month of March’15 when compared to Jan’15 and has remained stable over the period of last one year (varying only in +/- 5% range). 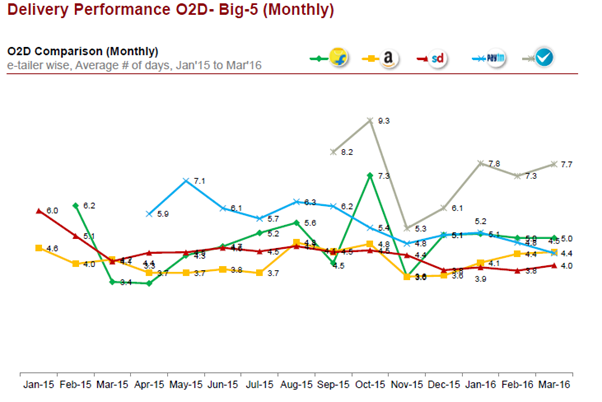 In case of Shopclues the O2D performance varies a lot from month to month primarily due to high reliance on multiple 3PLs every month.